A recent winter wander found me exploring “way down south”. That means anything below Manchester for this artist. It wasn’t any warmer there. 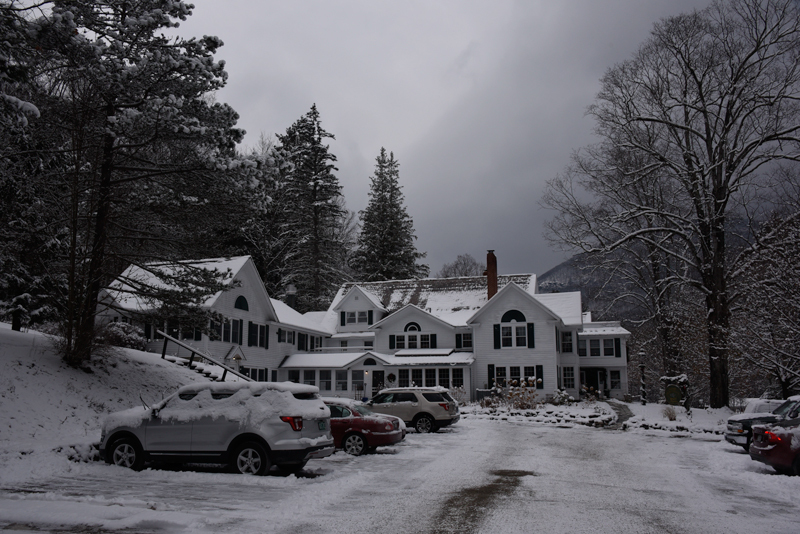 The beautiful West Mountain Inn in Arlington sits high above the Battenkill River. … on a snowy night. What a lovely painting. 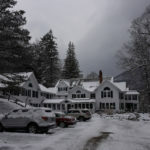 I would love to visit that Inn and thank you for posting the poem. Happy New Year Peter. Thank you for brightening all my Monday mornings. What a beautiful painting! Makes me want to go and see it for myself. Thanks for sharing your gifts with us. I love it and the poem – evoke such feelings! I can smell the wood smoke from the fireplace as snow crunches under my feet as I walk through your painting. It feels like home. So beautiful. Thank you very much for the painting and the poem. Have a very Happy and Healthy New Year. Beautiful inn and lovely poem. Would love to visit this place someday. An exquisite painting! 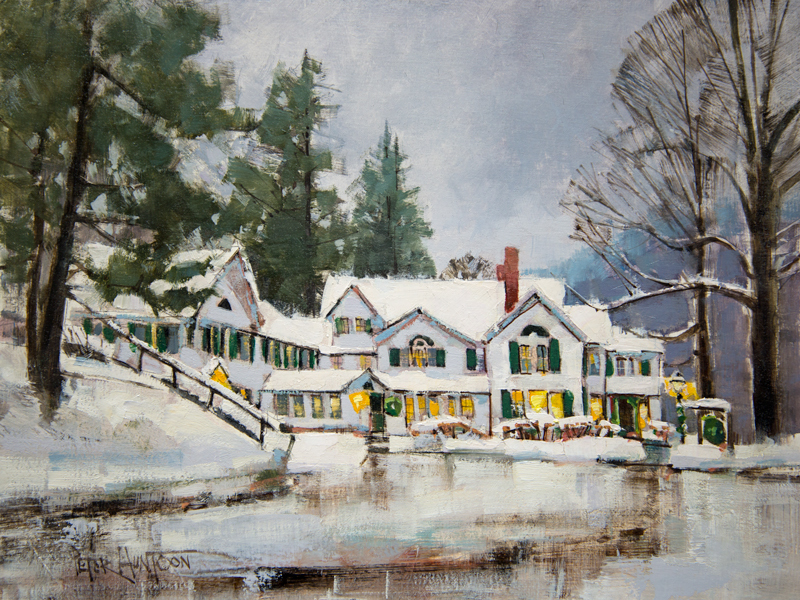 I am especially drawn to the subtle web of delicate darker lines of tree branches, rails, and roof and porch, that so unobtrusively but effectively draw the eye around and through the painting, leaving me, the viewer, with a heightened sense of the location’s beauty and peace. I am not sure how you did it, but those yellows really glow. They are not that different than the surrounding values, but they somehow give the impression of warm light illuminating beyond the interior. I love it. Very beautiful painting! Happy New Year Peter! I just love this painting…with the recent cold cold days the warmth that you have captured in the lights from the windows is amazing. It makes me feel warm and cozy. Happy new year, Peter! You are an amazing painter. What a comfortable inn! Brian Blaine speaks for me, he is always so exact in analyzing the paintings structure. And so I can dream to spend my holidays in this inn, walk around in the snow and enjoy this adorable house. Such a beautiful painting and poem. I love winter and they are the essence of the Season. Thank you. 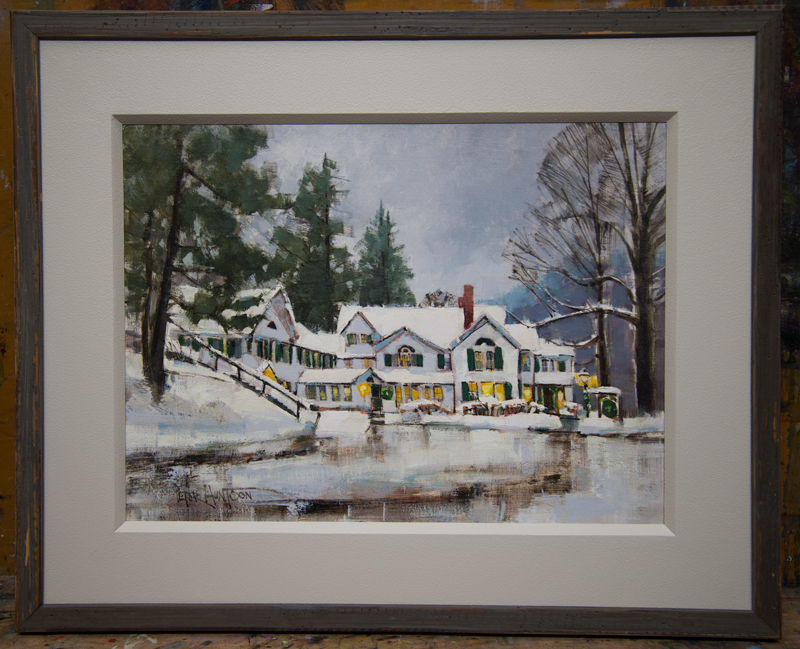 Very nice painting of a winter scene. Happy New Year Peter 2018. A nice winter scene in Vermont looks very cozy. This is lovely! I enjoyed the poem as well. Have a Happy New Year!! Beautiful painting! 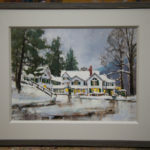 May I ask regarding your watercolor paintings, do you use hot or cold pressed paper. Also your videos look like they are a watercolor board. I just found your paintings a few weeks ago, and am enjoying watching your videos. Hi Maureen, for traditional transparent watercolor on paper (which I have not done much of the last couple of years) I prefer Hot press, or Fabriano Soft Press, which has a very gentle texture. When I do use watercolor now, it’s usually “watermedia”, and my definition of that is simply adding white gouache to my transparent palette. Yes, I paint on a rigid panel in this case, often Ampersand aquaboard or clayboard. Sometimes on gessoed MDF panel. Among the advantages of a rigid panel are you don’t have to contend with buckling paper, lifting is easier, and with an appropriate varnish, it may be framed without glass. excellent! very inviting the warmth inside…..